Today, you’re going to learn 25 phrasal verbs and their “normal” equivalents. For more English vocabulary, check out 59 Positive Personality Adjectives to Describe Your Favourite Friends. Did you know that for (almost) every phrasal verb, there’s a “normal” verb you can use instead? Annoying, right? I mean, why are you learning all these stupid phrasal verbs? Why did you have to learn “take up,” when you could just as easily use “start”? Why did you have to learn “give up,” when you could’ve just gone for “quit”? We don’t actually have to learn phrasal verbs to speak decent English. But, like many other things in English, we need to use phrasal verbs (and other multi-word verbs) to sound like we’re human and not from the planet Weird Robot. Phrasal verbs (like “give up”) make us sound more natural. But what about “normal” verbs (like “quit”)? These verbs are sometimes called “Latinate equivalents,” which doesn’t sound much fun. So I’m going to call them “brother verbs.” Much easier to deal with, right? I’m going to put these “brother verbs” into three categories, ranging from not necessarily formal to extremely formal. In the first category, the phrasal verb and its “brother verb” have about the same level of formality. Sometimes, the “brother verb” is the best choice in more formal situations, while the phrasal verb is less formal. “Please visit sometime.” — much more appropriate for when you want to invite the CEO of your company for dinner. Or the Queen of Sweden to watch the football. And sometimes, the “brother verb” is so formal that it would just sound weird in almost any situation. This is when we almost always use the phrasal verb instead. “She told me off for throwing pancakes at the president. Then she laughed.” — fine with almost everyone. Except for the president, of course. “She berated me for throwing pancakes at the president. Then she laughed.” — Too weird! This is far too formal. So in short, “two” on the formality-o-meter represents the sort of “brother verbs” Charles Dickens’ schoolmaster would have used, and “zero” is Carmen hanging out with her friends. As I mentioned above, the phrasal verbs in this category are fine in any situation — that means that you can use either the phrasal verb or the “brother verb” whenever you like. These are particularly useful when you have something you really need to talk about in detail. Anything you can cancel, you can also call off. We all know this one, right? OK. Most phrasal verbs fit into this category. These “brother verbs” are still very common, but we usually use them when we want to “step up” our language a little — when we want to sound a little more formal and respectful. Remember — you have to decide when to be formal and when to be more relaxed. This isn’t something I can teach you. But I can tell you one thing. Most English learners I’ve talked to tend to sound a little too formal. That’s fine, but as you get more confident, take my advice: start experimenting with the phrasal verbs and see what kind of reaction you get. When you use phrasal verbs, you sound more friendly, and you might be surprised by the positive reactions you get from people when you use them. OK. In this section, we’re going to look at phrasal verbs with “brother verbs” that are so formal that they just sound weird in almost any situation. So when would we use these verbs? These verbs are so formal that we usually only use them in things like academic English and formal writing. You might also see these kinds of words on signs, and you might hear them from formal, institutionalised figures like police officers and judges. What I’m saying here is that these are unusual verbs, but very occasionally, in certain formal situations, they are the right ones to use. 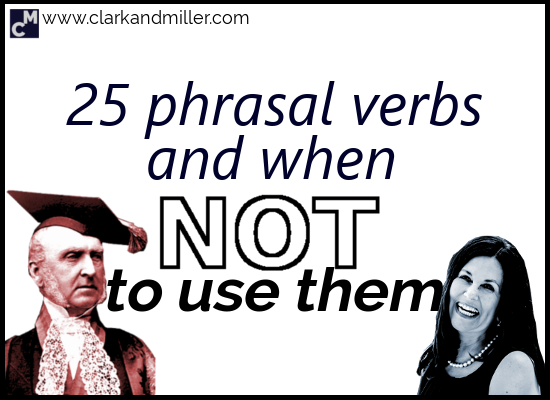 Are there any other phrasal verbs that have confused you in the past? Let me know in the comments. I’d love to help you out — hey, that’s what I’m here for! Meanwhile, if you found this post useful, BE AWESOME AND SHARE! It’ll make me happy and, more importantly, you’ll be spreading knowledge. And that’s an awesome thing to do, right? Thank you very much for the examples and explanation. Do Trong Tan from Vietnam. So glad to help! Keep up the good work! Can we use “show up” as the synonym of “turn up” ? It helps a lot! Thanks, Gabriel! Oh, yeah! I know that game very well. You just take any of the most frequently used verbs — two or three letters at the most (in a pinch five) and then just append the preposition (or even two!) in an absolutely random fashion. In fact the more it’s illogical the better. The point is to mask a proper (clearly understandable without a context) verb. That’s all. You will have won. These are both excellent examples of phrasal verbs in context. Thanks Andrey! And it’s even more interesting that LONGMAN doesn’t know this! Yes, it is a bit. Although “illocutionary force” comes up with a red underline when I write it here — so spell-check doesn’t like it, either.